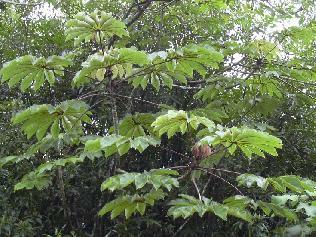 Maya Plant Use: Ritual use, medicine, food, animal forage and fumatory. This plant was used to make blow guns due to its long, straight, hollow branches. Botanical Significance: Cecropia sp. was used by the ancient Maya to make blowguns. Blowguns were used to kill a variety of forest animals including the agouti, monkey and deer. The branches of this tree were prized for its long, straight hollow stems. Blowguns can be seen in numerous polychrome ceramics, many of them depicting the Hero Twins. Notes: Syn: Cecropia mexicana Hemsl.